Last year, I dipped my toes into (feminist, multicultural) science fiction at the behest of a very close friend, and this year, I am jumping straight in. One of my favorite sci fi novels of 2016 was Becky Chambers' The Long Way to a Small, Angry Planet, mostly because it made me realize that science fiction can be kind and funny and optimistic and deeply moving. A Closed and Common Orbit is the sequel/companion novel to The Long Way to a Small, Angry Planet, and I prefer the sequel to the original, though the original is pretty great, too. I think I just generally prefer stories that are more in-depth in exploring the feelings and motivations of one or two people vs those of many people. A Closed and Common Orbit focuses on two characters whose paths mirror each other's, and I really enjoyed that. The book has two parallel plots. The first is around Sidra, a sentient AI who finds herself, suddenly, in a very limiting human body and has to learn how to make her way in a multicultural society with only the help of a few very kind friends. The second is around Jane, a lonely girl who escapes life as a factory drudge and has to find a way to make a life for herself, with only the help of one very kind AI, who helps her navigate life. I almost never want to share the plot points of science fiction or fantasy novels because I think people get caught up in the science or the magic aspects and ignore the greater message. This book is not about robots coming to take your job or the risks of automation. It is a deeply moving novel about defining yourself and what you stand for, when you have very few models of what to do to work from. It's about how terrifying it can be to make yourself vulnerable to another person, and how absolutely wonderful and comforting friendship and trust are. About how it's good to depend on yourself but also really, really great to trust someone else enough to depend on them, too. I loved so many things about this book, but one of the biggest things is the way that Chambers allows her characters to test each other and gives them space to question and grow. For example, Sidra challenges a friend about her body, and how she is not defined by or tied to one body. Her friend confesses that it is hard to admit, but that it is also a lot harder to feel empathy for an AI in a spaceship vs an AI in a human costume. Sidra is unhappy to hear this, and says so. Her friend feels safe enough to ask more questions and come to a more nuanced view over time. It really hits home on the importance of having a diverse group of friends with whom you can discuss important topics. I also can't emphasize enough how glorious it is to read a book that has a generally optimistic setting. Jane's setting is less rosy than Sidra's, but Jane has love and kindness in her life. She's a nice person. Sidra, too, never feels unsafe because of people being unsavory; she feels unsafe because she is a stranger in a strange land. In general, Chambers' book is about how varied and wonderful multiculturalism can be. It's not a perfect universe, but it's one that is trying. And that is just so refreshing! I stayed up very much past my bedtime to finish this one because I just couldn't put it down. I really, really enjoyed it. 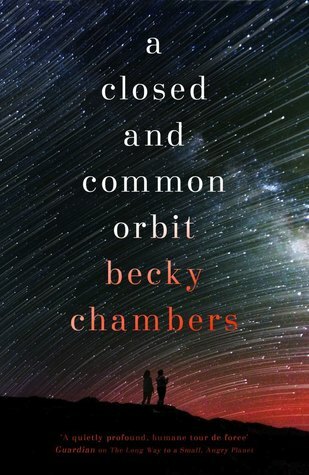 And if you'd like to try science fiction but aren't sure where to start, I think Becky Chambers is an excellent introduction to the genre! I think this book is a good introduction to the genre, too. One lifelong SF reader I know said she was a bit tired of AI stories, but she ended up liking this one. Oooh, this one sounds marvelous. I have The Long Way to a Small, Angry Planet on my TBR -- should I do this one first, you think? Does it matter? There isn't a lot of overlap between the two, so you could read them pretty separately and still get it all. Though I do think that there is more backstory on the different species/aliens and their cultures in The Long Way to a Small, Angry Planet, and then in the second one she kind of assumes you know some of that. So I would start with The Long Way and then move onto this one if that matters to you. They're both really good! Optimism is good, yay. I need to space out my reading a bit so I can get to the Lonely Planet one since my library only has it in e-version & I keep putting print books on hold. Great review as usual, thanks! I'm still trying to sort out if I want to read this book! I liked the first one but I think my expectations were too high? Or maybe "too high" isn't fair -- I think my expectations were different from what the book turned out to be, and it made me enjoy it less than I expected to. So I think if I read the sequel, it would be better? I'd know better what to expect. And I do love stories that deal with AIs in interesting ways.